Jump off the edge of a cliff and into the liberating experience of flying. It isn’t too far-fetched to say that the seaside district of Miraflores is a lot more captivating when viewed from more than 200 meters above. Every day professional paragliders gather near Parque del Amor in Miraflores along the bluffs of the Pacific Ocean to offer 30 minute rides to adventure seekers. 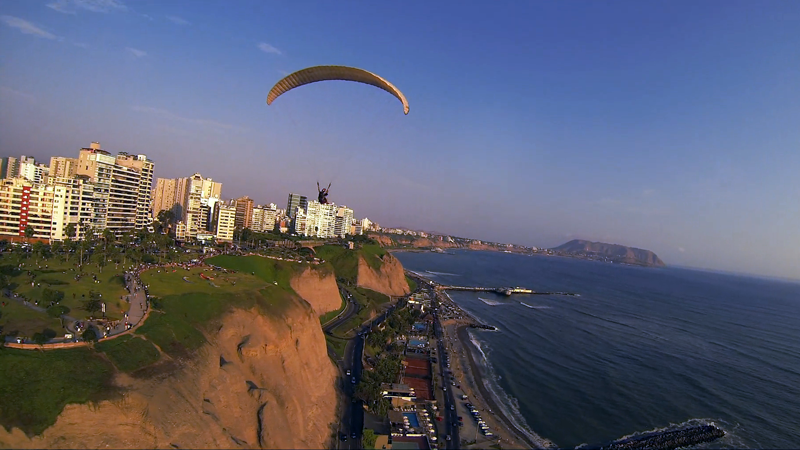 Here you will be strapped in as the paraglider steers through Lima’s steadycoastal winds. You will catch your reflection against Lima’s skyscrapers (some gliders reportedly have peeked into business meetings) or appear to plummet toward the Pacific Ocean as the master glider performs a classic “death spiral” maneuver. All of this completely at your whim: No waivers to be signed, and no contract other than the handshake of one of a number of pro gliders who make the Miraflores cliffs and the wind their exciting work place.